In one animation, you see multiple letters fly in through the fireplace with news of Harry's acceptance to Hogwarts wizardry school. Text and an illustration from "Harry Potter and the Chamber of Secrets" are displayed on an iPad, Wednesday, Sept. 30, 2015, in New York. The editions, released Thursday, are exclusive to Apple's iBooks Store and require an Apple Inc. mobile device or a Mac computer to read. 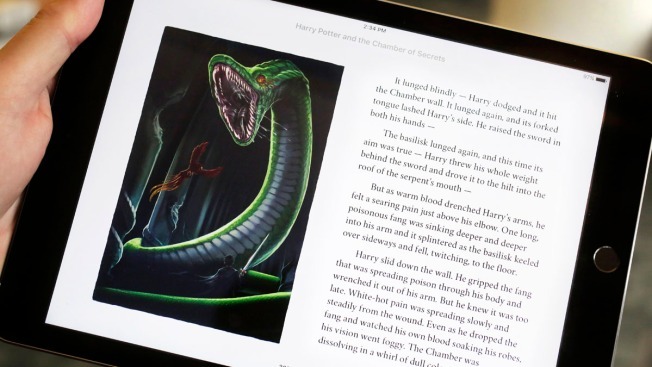 For other devices, including Amazon's Kindle, standard electronic editions are available through Rowling's Pottermore site. Jimmy Fallon and Kate Winslet take turns taking weird pictures with the Photo Booth iPad app and attempt to match each other. The books also get new digital covers to reflect each book's theme - serpents for the second book, for instance. Artists also designed a new font with each letter incorporating a lightning bolt - the shape of a scar on Harry's forehead. This font - named Fluffy, for a three-headed dog in the first book - is used for the opening letter of each chapter.